The AFC125 features larger headstock design, 3-piece Mahogany/ Maple set-in neck and bound Ebony fretboard with hand rolled fret edge treatment provide maximum playing comfort and smooth articulation. 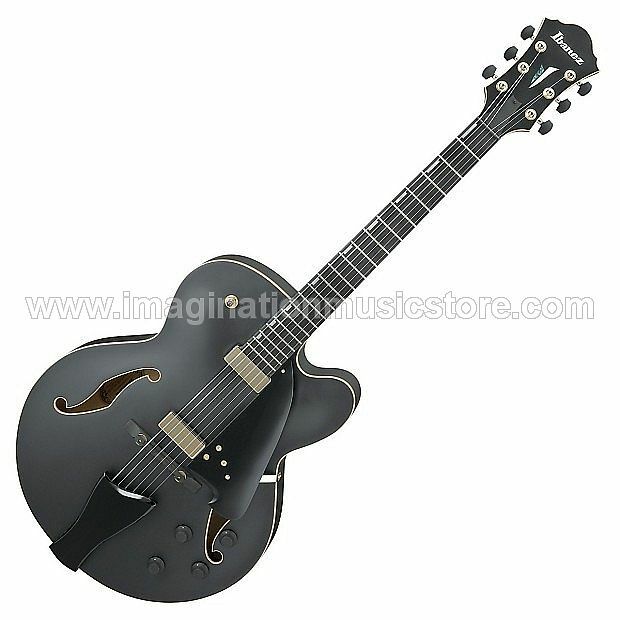 Built with a Spruce top, Maple back and sides with Flamed Maple bound hollow body, all dressed in chic satin black finish. As well as providing its stylish appearance these elements provide a balanced tone, and with the addition of plywood top, help to avoid unnecessary feedback. The Rock solid Ebony compensated bridgeprovides better intonation, longer sustain and acoustic resonance. The AFC125 comes with the Ibanez custom made Magic Touch-Minihumbucker pickups, providing a balance of classic tones, alongside clear articulation on both the top and bottom of the sound spectrum. Players can enjoy the clean response on the top end, presenting fast melodies or complex chord progressions with clarity and precision. The bottom end also has a deep warm and rich classic sound, but with a clarity specially adjusted to help avoid muddy low end tones. This tonal balance is complimented by the pickups’extra sensitivity that clearly captures and accentuates the players pick attack and plucking style opening the possibilities of a wide range of playing techniques. Thanks to floating mount, the Magic Touch-Mini pickups do not dampen the guitars natural body vibration, thus allowing a bigger richer acoustic tone. These are all complimented by the newly designed pickguard, tailpiece cover and wooden control knobs. The AFC125 comes with hardshell case.